Testing and embracing Stacore | What's Best Audio and Video Forum. The Best High End Audio Forum on the planet! I realize that this is a thread about Stacore. I think that Stacore has four air bladder isolator feet, while my Vibraplane has only three, two in front and one in back. However, I thought this information might be of some interest to those who are thinking about passive air isolation platforms and optimizing their effectiveness. I posted this also in my system thread. I welcome any comments or suggestions about the value of this experiment. For some time I have been meaning to confirm that my turntable, motor controller and the steel ballast plate on which they are placed, are centered on my Vibraplane. The intent was to equally distribute the weight/mass over each of the three air bladders to potentially increase the longevity of each, and also to perhaps improve the effectiveness of this isolation approach and ideally improve sonics. I figured out a simple way to do this without scales and measurements, and calculations. I went to the hardware store and for $2 bought a 36" X 1/4" round dowel. I deflated the Vibraplane and marked the center of the top plate. I then placed the dowel on the top plate and located the center of gravity by sliding it around until it was balanced. This was no so easy as the turntable, controller, and ballast plate together weight about 250 lbs. With some effort, I was able to locate the center, in one axis, and I moved the mass over the center of the Vibraplane. The other axis is more difficult. I can find the center of mass of the table and plate, but the center of the Vibraplane is no so clear because it is square, but the three air bladders are unequally distributed, with two in the front and one in the rear. So, for this axis, I simply moved the turntable and controller toward the front, so they are more directly over the two bladders in front. When I went to re-inflate the three bladders, the table rose more evenly than before, so it is an improvement. I will have to wait to assess any sound quality change until after I get one of my Transparent Audio cables back. It is at the factory being recalibrated for the new output impedance of my new phono stage. Shifting the turntable forward to be more over the two air bladders in the front of the Vibraplane. This method of course works when it comes to finding the center of gravity (CG) of the equipment. But when it comes to equalizing the load seen by the bladders, there is also the substantial mass of the platform which enters the picture. If you consider the platform alone, the lonely air bladder sees 50% of the platform mass, while the other two see 25% each. So there is already a load disbalance by the very construction. Have you noticed that when pumping the platform, one section needs more pressure to rise to the same level as the other two? However I do not think that this disbalance matters much and what you do, i.e. placing the CG of the TT at the geometrical center of the platform (which I assume is the center of the triangle formed by the bladders), is enough. As comes to bladder longevity, at least in our case, if the bladders ale operated within their safe operating area (10mm elongation, 5 bar pressure) they should last forever. Thanks Jarek. That makes sense. My Vibraplane has automatic leveling and is hooked up to a compressor, so I never have to pump up anything. There is one pressure gauge on the side (seen in photo). I set that control to 80 lbs. I released the pressure valve today to do this experiment. When I reinflated the unit, I think the valve is connected to all three and it applies equal pressure to all of them at the same time. The front of the platform rose slightly before the rear because, as you correctly suggest, there is more weight on that lone bladder. But, with the turntable toward the front, the platform is more balanced than before and it raises more or less level at the same time. Before, the front rose quickly followed later by the back. I assume each air bladder has the same 80 lbs pressure, but the level knob for adjustment is slightly different so that the table is level. I don't think the center of gravity of the platform is in the center of the three footers because, as you say, the lone footer sees more weight, so to balance the load equally on all three footers, the load needs to be biased toward the two front footers. My Stacore setup is now final. 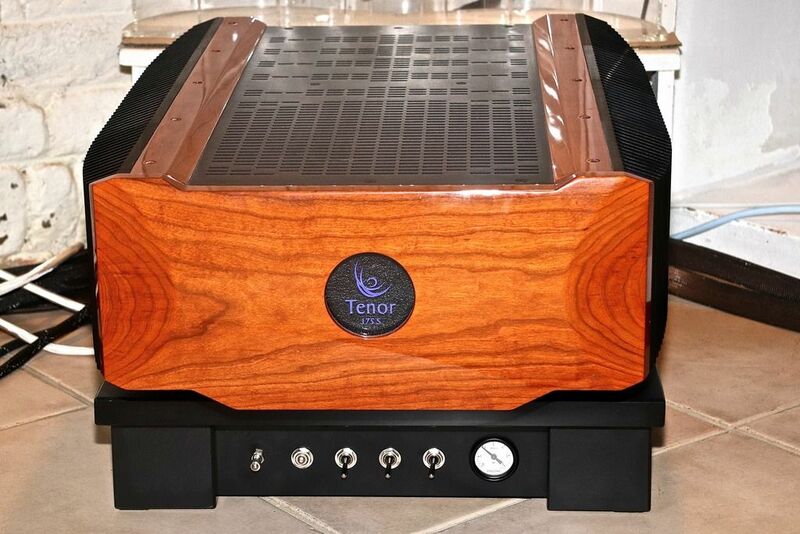 The Tenor Audio power amp has its dedicated Basic Platform. The sonic benefits are quite impressive and actually even greater than with the Krell amps. Maybe is it due to the hybrid tube/solid state design of the Tenor Audio. And there is something else but I promised Jarek not spilling the beans... So I will let him the pleasure to make the announcement. The only thing I will say is that I enjoyed being part of the process. "If you consider the platform alone, the lonely air bladder sees 50% of the platform mass, while the other two see 25% each. So there is already a load disbalance by the very construction." Is this statement correct? Surely each of the three air bladders experiences exactly the same load until a component with an asymmetric mass distribution is placed on top? I only studied physics in my first year of university and I was much better at chemistry. Exclusive New South Wales (Australia) representative for Acoustical Systems. It wouldn't be correct if the platform were triangular Here we have a rectangle supported by a triangle, so it's more geometry rather than physics. Also pls note that I was talking only about the mass of the platform alone, not considering any equipment on top of it. In both Vibraplane and our cases this mass is substantial, ranging 70-95kg. Yes, this is why I have moved my heavy turntable toward the front of the Vibraplane, to more evenly distribute the weight over the front two air bladders because the single one in the rear sees much more load from the platform itself. In my case, it is only an approximation. As I have a swinging wood floor and I got the Stacore Basic + platforms a few weeks ago, I tested putting speakers on them. It was for my a logical solution to isolate the speakers from the floor. I did that up to now with the ISOacoustics GAIA and that worked fine for me, but when I put them on the STACORE basic + a compete new dimension was opened. So many details where berried under the not clean low frequencies, I suddenly had a complete now audio system in front of me! There were a lot of details there I had never heard, the base got a lot more precise and the hights got much more airy. The stage got deeper and wider. The vibration in the voices got much more hearable. This is one of the biggest improvements I have ever had in a system with just one simple but very efficient change. Yes I am the distribution for STACORE in Germany / Austria and Swiss, but I would like to invite anyone to my studio here in Munich to listen to the big improvement! Fascinating report, Michael. Congratulations. I think Jarek mentioned that he was looking at developing some kind of speaker/floor interface or support to expand his product line. It will be very interesting to see what he discovers and comes up with. I remain fascinated with our pocesses of discovery. How we are continually delighted upon hearing something significantly better than what we knew. Since you have Stacore under many components, do you have a sense about where they make their most significant contribution? Turntable. electronics, speakers ? The most, for me under the speakers, then sources then amps. Michael, did you ever try lifting those speakers up off the floor on a solid platform? How are you sure that the improvement you heard is from the isolation rather than the new speaker position? Or, perhaps it is some combination of the two. I once suggested to member Al M. that he raise his stand mounted monitor speakers up on two concrete paving blocks for stability. He did and was impressed with the improvement. I also wonder how Jarek's new entry level constrained layer platform without the spikes would affect the sound of a pair of speakers. They are much lower profile than his pneumatic platforms. Interesting suggestion Peter, thank you! Hope to find time to try it and report back. Impressive as always. Do I understand that you have designed a new horizontal frame compared to my rack or is it just for the sake of the picture? Thank you Denis! What is on the picture is just a support structure for a demo. But indeed there is a change in the horizontal frame construction compared to yours. We moved from a welded frame, which was insanely expensive to manufacture, to a 1” laser cut steel one which is practicaly equally good plus offers more flexibility in rack configuration.